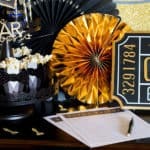 I love finding decor pieces that can be used party to party or year to year. 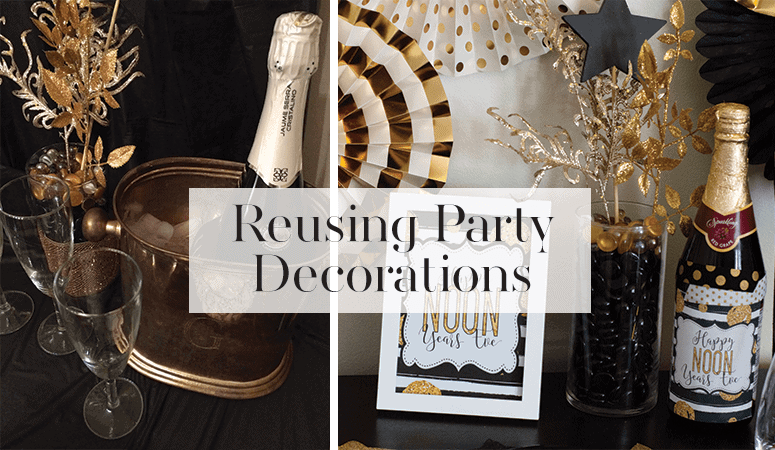 Reusing party decorations is a great option for a couple of reasons: money and space. I’m usually on a budget for party decorations and so I have to be somewhat thrifty with my selections. My house is also somewhat small, I just don’t have the storage space I need to hold all sorts of decoration pieces and items used to style a party. 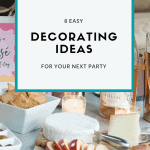 To combat these limitations, I typically try to reuse party decorations, or use similar colors so I can utilize the same supplies for multiple events. 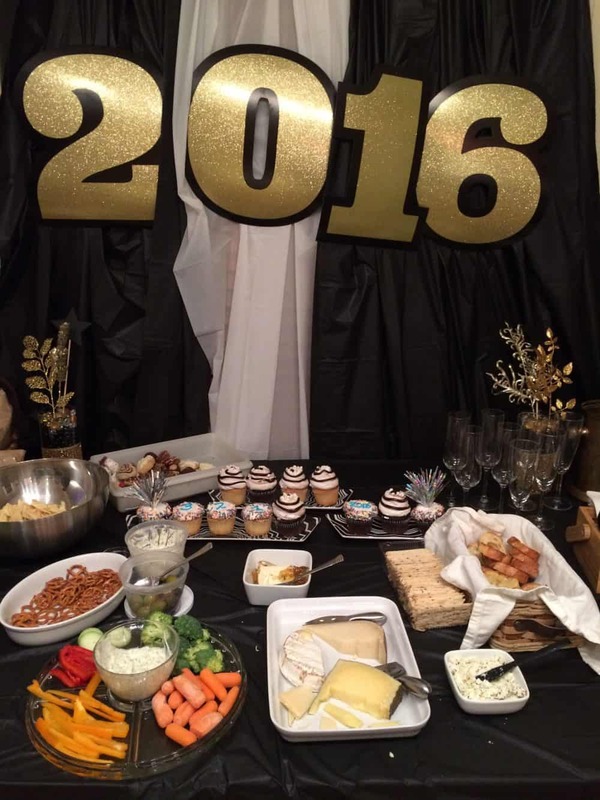 Last year for New Years Eve, I used black, gold, and white. Guess what colors I chose for this year? You got it: black, gold, and white. You might think, “Wow, it’s exactly the same. 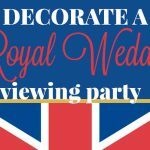 How boring!” Except it was a completely different feel to the party and I was able to use a couple of similar decoration pieces, including the centerpieces. 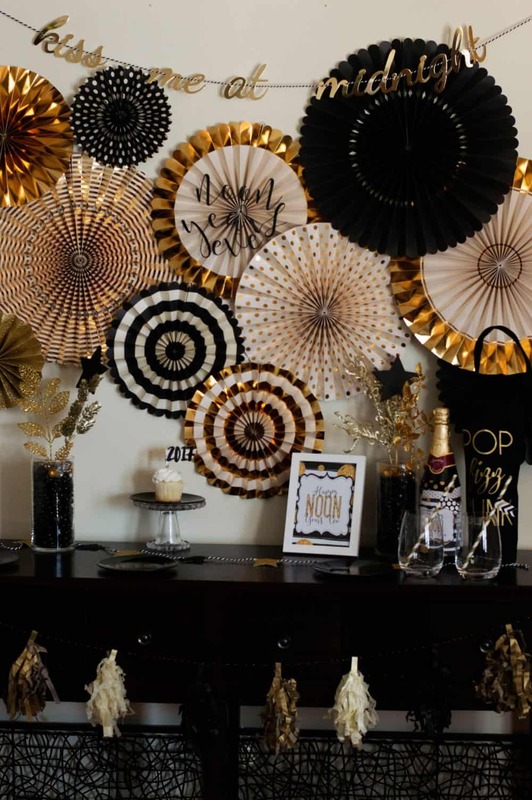 I used table cloths hung up as the backdrop, and then hung large glittery and gold numbers that I picked up from Target. This created an extremely inexpensive backdrop. Looking at that spread is making me hungry! I used paper fans as the big backdrop item, which I picked up from My Mind’s Eye. I think they make a very striking backdrop. Many of the rest of the pieces I picked up at Target, including the bunting and the “Kiss me at midnight” banner. I designed that little party sign and sparkling juice label. Here’s a side by side view of NYE 2016 and NYE 2017. What do you see in common? For NYE 2016, I wrapped them in some sparkly ribbon, but otherwise they are exactly the same. Except the party vibe is totally different. I created them using a large cylinder vase, and sticking in black and gold marbled pebbles (I’m not entirely sure what they are called exactly) and then stuck in the gold leaves I picked up on clearance at Michaels, and the little chalkboard stars. How do you like to reuse decoration items? 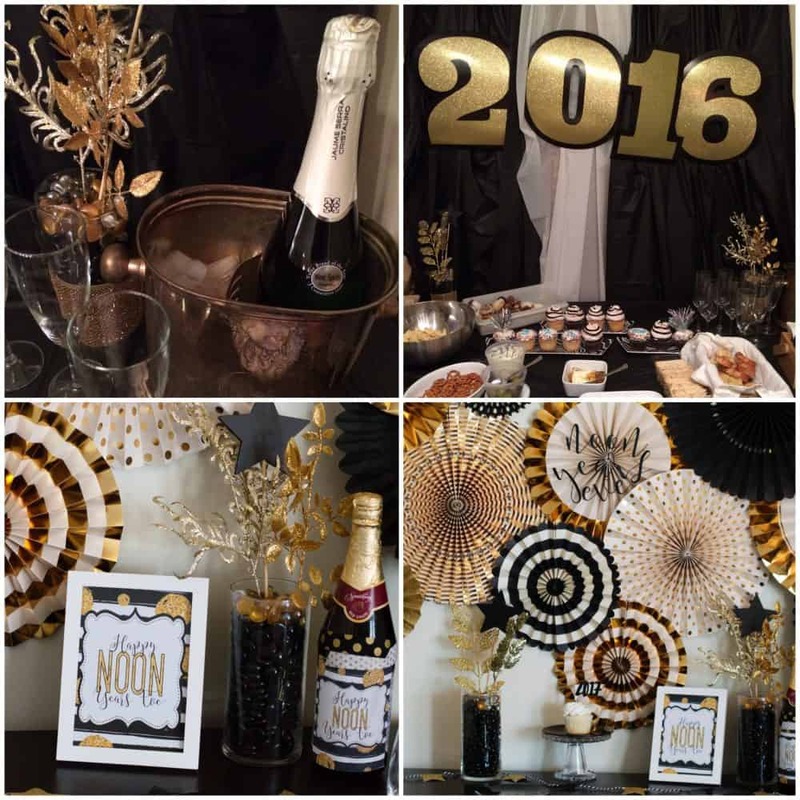 You can see more of my Noon Years Eve party a post back.